How does ROSE Bikes keep ahead in the bike market? How does ROSE Bikes stay ahead? The topic of cycling is highly emotional for many people, even representing a very individual lifestyle. Not least for this reason, ROSE Bikes’ core values include functionality, straightforwardness and extremely customer-oriented services, coupled with a high degree of individuality. To convey this mixture of technology, emotion and passion for cycling, ROSE Bikes needs more than just a standard e-commerce shop. There is more on offer than the customers’ desired function and design. ROSE Bikes might not be reinventing the wheel, but they are definitely reinventing cycle purchases and the configuration experience. As a pioneer in distance selling and online mail order, ROSE Bikes not only realized how important it is for a company to be constantly developing and trying out new things. In its own logistics center, and even in its graphics and design department, ROSE Bikes has always taken an innovative approach. From that starting point, the step toward a company-wide transformation was not difficult. The company followed a classic MVP approach for the relaunch. 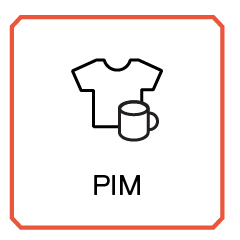 Having a clear view of the most important features, it succeeded in keeping the e-commerce transformation focused and lean. For ROSE Bikes, the key feature is bike configuration, which is gradually being expanded and optimized. Customers can design their bikes individually from components, so they are better configured to their own requirements. The integration of product attributes and tags has now improved categorization in the shop. 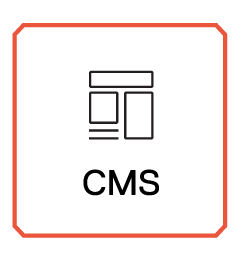 The combination of product attributes and filters then facilitates the targeted and detailed structure of the search function for the configurator as well as for the rest of the shop. Elasticsearch has also been implemented with many powerful features, such as the synonym search. These features help simplify the user journey in the shop and take the presentation to a new level – all controlled by us and therefore perfectly adapted to ROSE Bikes’ requirements. 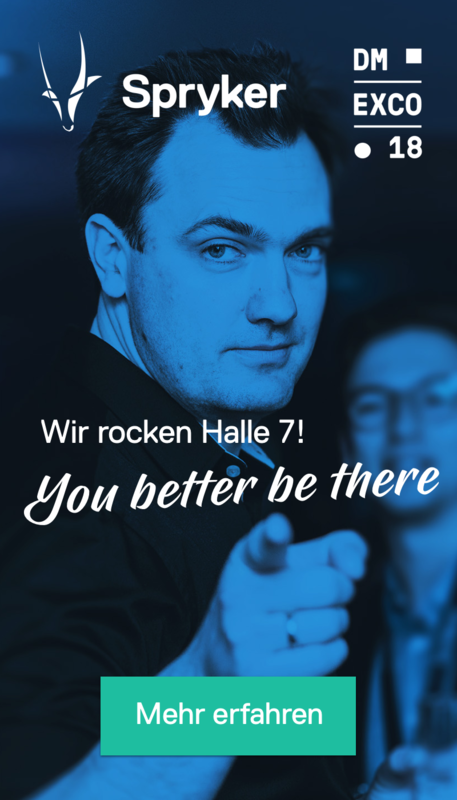 From the first hour, ROSE Bikes has been successfully running with the payment module of the heidelpay GmbH. 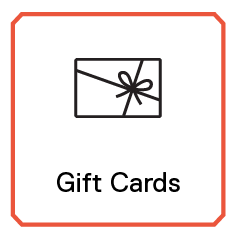 ROSE Bikes customers can pay easily via credit card, Paypal, bank transfer and iDeal. 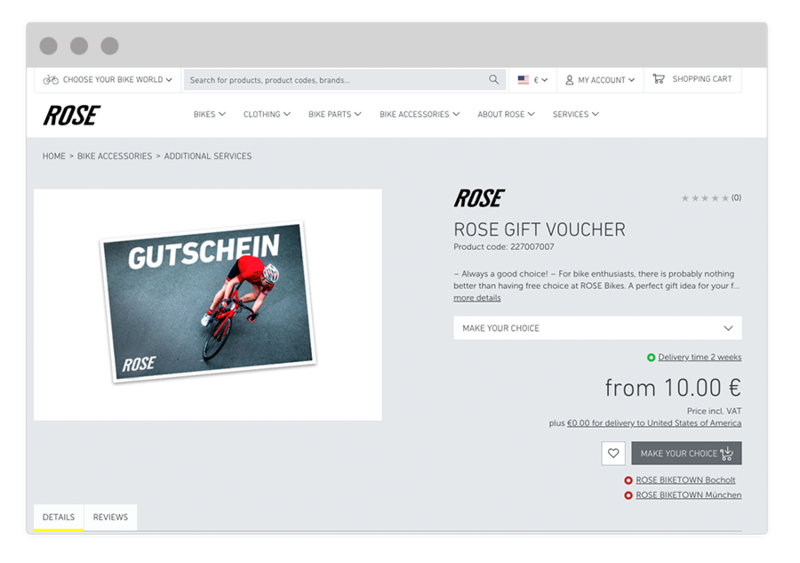 The payment model of heidelpay GmbH thus enables a smooth check-out process tailored to the needs of ROSE Bikes. As a result of the seamless integration into the Spryker Commerce OS, the system could be transformed in the shortest possible time, ensuring reliable payments throughout. 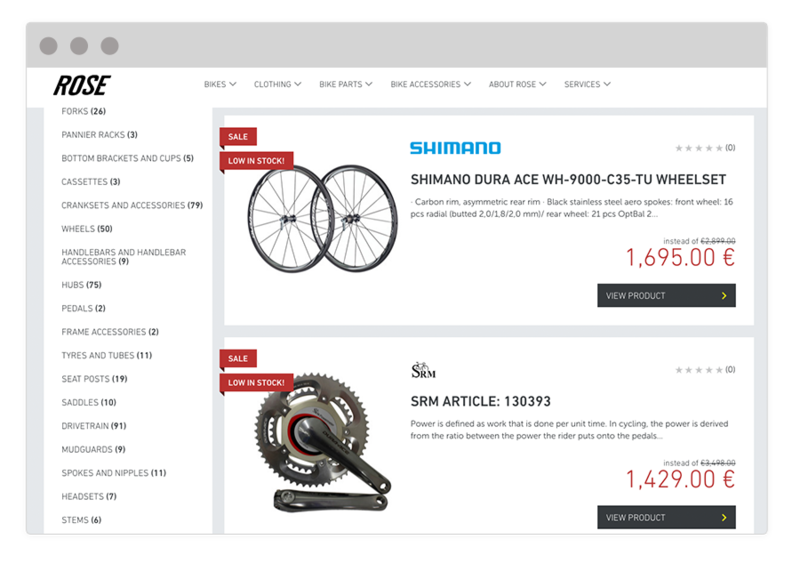 ROSE Bikes uses the Spryker Discount Engine to offer its customers attractive prices and special offers, as well as B-grade goods. 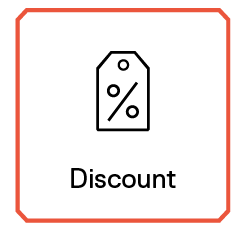 Using this, discount rules can be created quickly and clearly, and even time-limited price promotions are child’s play to implement. 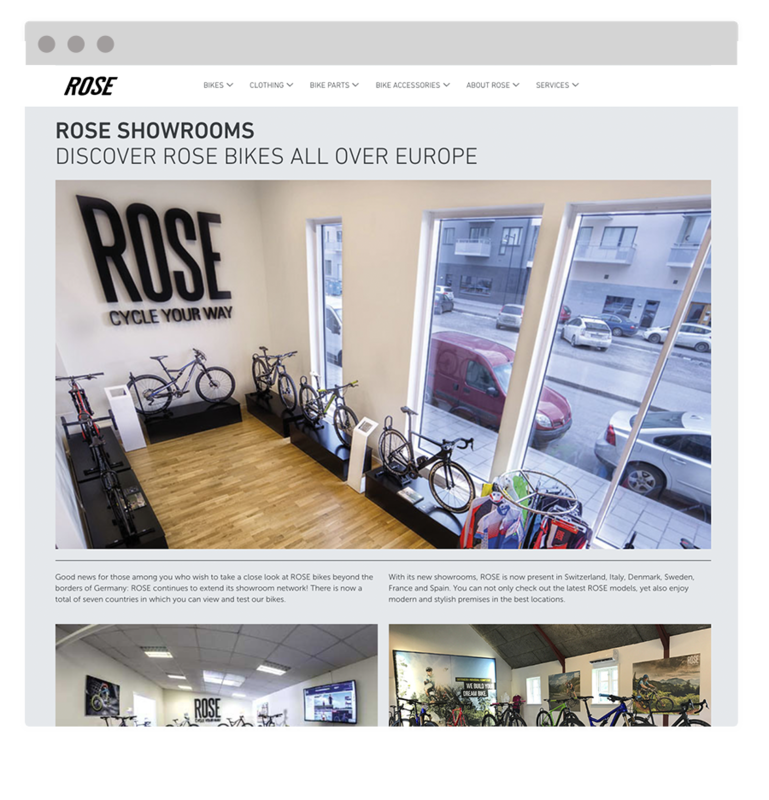 Content integration – especially for ROSE Bikes’ own brand and other products – is an important step toward recreating the emotion and passion for cycling online. 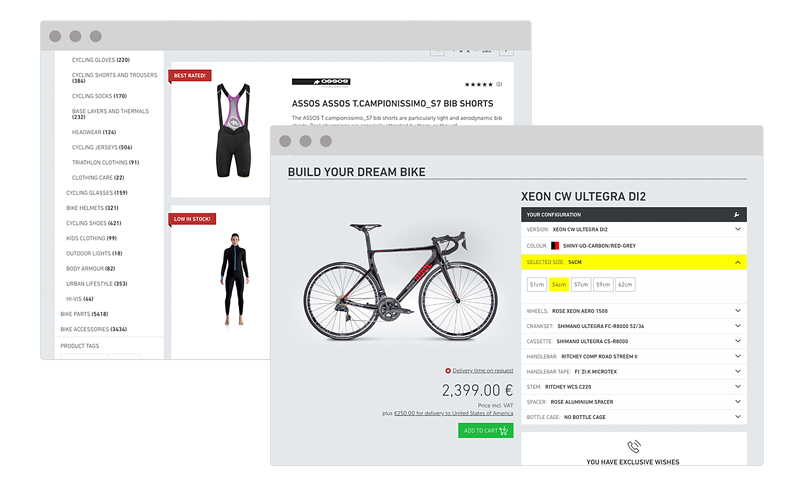 With Spryker’s CMS, ROSE Bikes has succeeded in connecting content and products, thereby create a lively and informative shopping experience for customers. The Spryker Commerce OS is helping ROSE Bikes increase usability and reduce the rate of shopping-cart abandonment. According to Managing Director Heckrath-Rose, the speed has increased many times over, significantly reducing the number of abandoned purchases. Interested in more Spryker case studies?